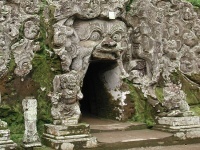 Built in the 9th century, Goa Gajah, or Elephant Cave, is located near Ubud and originally served as a sanctuary; it is now a UNESCO World Heritage Site. With a wonderfully carved entrance featuring menacing creatures and demons, children will find a visit to this historic cave an unforgettable experience (as will adults!). The main figure was once thought to be an elephant, hence the name, and in the 1950s a bathing pool was excavated, thought to have been built to ward off evil spirits. Visitors can wash their hands and feet in the fountains and there are usually locals on hand selling prayer offerings and the like - sometimes monks will offer blessings for travellers. Those who would like a tour guide will find that there are always locals offering this service and the tours can be very informative. The entrance is the most impressive feature of the cave and the interior will not take long to explore. There are some lovely gardens and trees surrounding the cave though, and a few stone carvings, so it is worth having a stroll around. All visitors will require a sarong or cover-up to enter the temple and there are many shops selling them on the way but they will lend you one for free (or a very small price) at the entrance. In the early morning the temple grounds are almost deserted and this is a magical time to explore if you prefer to avoid crowds.